1.2 By accessing or using this Site you agree to be bound by, and comply with, these terms and conditions and the documents referred to in them. If you do not agree with or accept any of these terms, you should stop using the Site immediately. 1.3 We may update these terms from time to time in accordance with clause 13.3 below. 2.1 The Site is operated by Considerate Constructors Scheme Limited (“we”, “us” or “our”). We are a company registered in England and Wales under company number 3465121 and have our registered office at 26 Store Street, London, WC1 7BT. References to us in these terms also include our group companies from time to time. 3.2 The Site is intended for use only by those who can access it from within the UK. If you choose to access the Site from locations outside the UK, you are responsible for compliance with local laws where they are applicable. 3.4 In addition, your right to use the Site does not permit you to attempt to decompile (as defined in section 50B of the Copyright, Designs and Patents Act 1988) the underlying software (or any part of it) that is used in or to provide the Site, or to observe, study or test the functioning of the underlying software (or any part of it) that is used in or to provide the Site, except and only to the extent that such restrictions are prohibited pursuant to section 50B of the Copyright, Designs and Patents Act 1988. 3.5 We may prevent or suspend your access to the Site if you do not comply with any part of these Site terms and conditions, any terms or policies to which they refer, or any applicable law. 4.1 In order to use certain features of the Site or content available on the Site you may be required to create and manage an account on the Site (an “Account”). Accounts may be created on the Site by you choosing, or being provided with, a user identification code, password or other piece(s) of information as part of our security procedures (“Account Information”) to set up and manage your Account. 4.2 The Account services are intended for adults only, who are resident in the UK. Any person under 18 who wishes to register must have their registration on the Site confirmed by a parent/guardian. By registering of confirming a registration of the Account services, you warrant that you are 18 years of age or older and are resident in the UK. We reserve the right to terminate your registration without warning if we believe that you are under 18 years of age and/or are not resident in the UK. 4.3 You agree that you are solely responsible for keeping your Account Information confidential. You must not disclose your Account Information to any third party. If you know or suspect that anyone other than you knows your Account Information you must promptly notify us. 5.1 If you establish an Account on behalf of a company, organisation (including a school), entity, or brand (a “Brand”, and such Account a “Brand Account”), the terms “you” and “your”, as used throughout the Agreements, apply to both you and the Brand, as applicable. 5.3 If you create an Account as an individual user and at a later date you wish to use that Account as a Brand Account then you must tell us by sending an email to [enquiries@ivorgoodsite.org.uk]. 6.1 We may update the Site from time to time, and may change the content at any time. While we try to make sure that the Site is accurate, up-to-date and free from bugs, we cannot promise that it will be. Furthermore, we cannot promise that the Site will be fit or suitable for any purpose. 6.2 The Site is provided on an “as is” basis and we make no representations, warranties or guarantees, whether express or implied, that the information on the Site is accurate, complete or up-to-date and you are advised to take independent advice on specific matters. This information is not intended to constitute medical, technical, financial or legal advice or any other type of advice and should not be relied on for any purposes. Any reliance that you may place on the information on the Site is at your own risk. 6.4 Access to the Site is permitted by us in our sole and ultimate discretion. We may suspend, withdraw, discontinue or change all or any part of the Site as we see fit and without notice. We will not be liable to you if for any reason the Site is unavailable at any time or for any period. 6.5 We hope that the content is helpful, but please note the limitations of our liability in clause 11. 7.1 The Site contains a variety of material, including (without limitation) material relating to news, product listings, costume rental, competitions, opinions, downloadable teaching materials, games and related text, graphics, logos, trademarks and guidance. 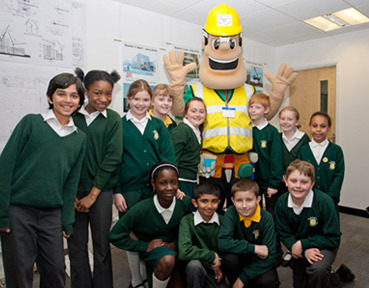 Content is provided to encourage the younger generation to understand and engage with the construction industry, including through content relating to registered sites, companies, suppliers and schools. 7.2 The Site may contain hyperlinks or references (including banner and pop-up advertising) to third party websites other than the Site. We have no control over third party websites and accept no legal responsibility for any content, material or information contained in them. The display of any hyperlink and reference to any third party website, product or service does not mean that we endorse that third party’s website, products or services and any reliance you place on such hyperlink, reference or advert is done at your own risk. 7.3 Your use of a third party site may be governed by the terms and conditions of that third party site. It is your responsibility to ensure you are happy with such third party terms and conditions. 7.4 You may link to the Site from another site provided you do so in a way that is fair and legal and does not damage our reputation or take advantage of it. You must not present or establish a link in such a way as to suggest any form of association, approval or endorsement on our part where none exists. We reserve the right to withdraw linking permission without notice and to require you to immediately remove any link to the Site at any time, and you shall immediately comply with any request by us to remove any such link. 8.1 You are solely responsible for the accuracy and reliability of any data entered or uploaded to the Site by you while using our services (“your Data”). 8.2 You retain ownership of your Data and all rights therein. Nothing in these T&Cs grants us, or transfers to us, any legal rights in your Data other than as necessary for us to process your Data in accordance with our T&Cs, for example to provide you with access to the Site and any services made available through it. Subject to clause 8.3 below, we will only use your Data for these purposes. 8.3 We reserve the right to disclose your Data to law enforcement officials and/or HMRC in the investigation of fraud or other alleged unlawful activities. 8.4 While we try to make sure that the Site is secure, we cannot guarantee the security of any information that you supply to us and therefore we cannot guarantee that it will be kept confidential. For that reason, you should not let us have any information that you regard as confidential, commercially sensitive or valuable. While we value your feedback, you agree not to submit any such information. 9.2 Without prejudice to the generality of the above clause, you acknowledge that IVOR GOODSITE and the Ivor Goodsite character logo are trademarks of Considerate Constructors Scheme Limited and that our Considerate Constructor Scheme logos (http://www.ccscheme.org.uk/index.php/ccs-ltd/what-is-the-ccs/support) are our exclusive property. You further acknowledge that you obtain no rights to or in said logos and trademarks except where otherwise agreed in writing from time to time. 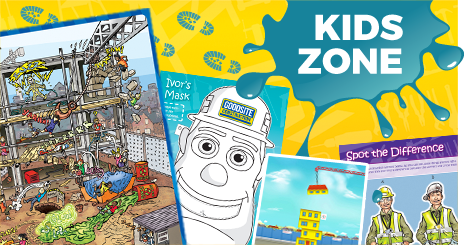 You agree to comply at all times with our ‘logo usage’ policy for CCS: http://www.ccscheme.org.uk/index.php/ccs-ltd/what-is-the-ccs/support, and for Ivor Goodsite. Use of the character logo without permission is prohibited, please forward requests to [enquiries@ivorgoodsite.org.uk]. 9.4 Except as otherwise stated or as expressly agreed (in writing), nothing in these terms and conditions grants you any legal rights in the Site other than as necessary to enable you to access the Site, and any further or additional use is strictly prohibited unless you have our prior written permission. 10.1 We do not guarantee that the Site will be secure or free from bugs or viruses. You are responsible for configuring your information technology, computer programmes and platform in order to access the Site. You should use your own virus protection software. 10.2 You must not misuse the Site by knowingly introducing viruses, trojans, worms, logic bombs or other material which is malicious or technologically harmful. You must not attempt to gain unauthorised access to the Site, the server on which the Site is stored or any server, computer or database connected to the Site. You must not attack our site via a denial-of-service attack or a distributed denial-of service attack. By breaching this provision, you would commit a criminal offence under the Computer Misuse Act 1990. We will report any such breach to the relevant law enforcement authorities and we will co-operate with those authorities by disclosing your identity to them. In the event of such a breach, your right to use the Site will cease immediately. 10.3 We will not be liable for any loss or damage caused by a virus, distributed denial-of-service attack, or other technologically harmful material that may infect your computer equipment, computer programs, data or other proprietary material due to your use of the Site or to your downloading of any content on it, or on any website linked to it. 11.2 Subject to clause 11.1, and to the extent permitted by law, we exclude all conditions, warranties and/or representations, whether express or implied, which may apply to the Site or any Content on it. 11.3 Subject to clause 11.1, we will not be liable to any user of the Site for any loss or damage, whether in contract, tort (including negligence), breach of statutory duty, or otherwise, even if foreseeable, arising under or in connection with the use of, or inability to use, the Site, or with your reliance or reliance of any third party on any content displayed on the Site. In particular, we will not be liable for any business interruption, for any direct loss of profits, sales, business, revenue, anticipated savings, business opportunity, goodwill or reputation, or for any indirect or consequential loss or damage. 13.1 Events beyond our control – We shall have no liability to you for any breach of these terms caused by any event or circumstance beyond our reasonable control including, without limitation, strikes, lock-outs or other industrial disputes; breakdown of systems or network access, including but not limited to electric power, gas or water, non-performance by suppliers or sub-contractor; or any order or enactment of legally constituted authority of any country; or flood, fire, explosion or accident. 14.3 If you and we cannot resolve a dispute using our internal complaint handling procedure, we will let you know that we cannot settle the dispute with you, and give you certain information required by law about the options available to you.